Exceeding market expectations with another strong quarter, Apple saw growth in its three main businesses of iPhone, iPad and Mac, on its way to $46.7 billion in revenue. Following the reveal, the company held a conference call with media and analysts, and notes of interest follow. 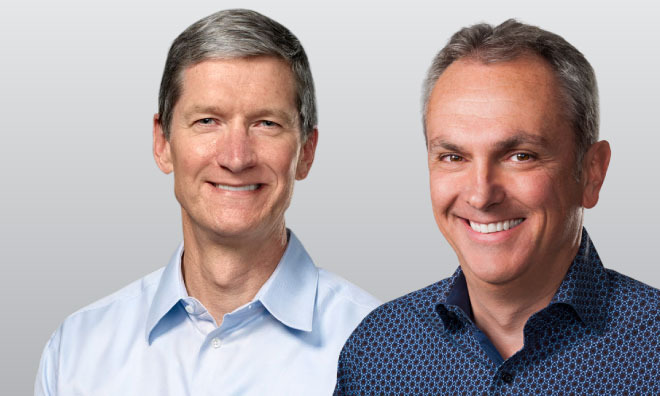 Participating in Thursday's call were Apple Chief Executive Tim Cook and Chief Financial Officer Luca Maestri. The Mac just completed its best year ever, with the highest annual revenue in Apple's history. iPhone 8 and iPhone 8 Plus have been Apple's most popular models since they launched. Apple Watch sales grew 50 percent and it remains the best selling smartwatch in the world. Apple expects this holiday season to be its biggest quarter ever. Apple ended the quarter with $268 billion in cash and marketable securities, up $7.4 billion. iPhone 8 and 8 Plus instantly became two most popular iPhone models at launch, and have been every week since then. Cook said that the iPhone 8 Plus got off to the strongest start of any Plus model to date, called it a "surprise" to them. iPhone X launch is underway. Orders are "very strong," Cook said. "We believe AR is going to change the way we use technology forever," Cook said. He said that AR amplifies the human experience. "It should be a help for humanity, not an isolation kind of thing for humanity." Also cited the power of CoreML and machine learning in iOS 11. Cook said the ramp up for iPhone X production is "going well," adding that "we're really happy that we're able to increase week by week by what we're outputting, and we're going to get as many of them as possible to customers as soon as possible." All time record quarter for Mac sales in mainland China. Best year ever for the Mac. Highest annual Mac revenue in Apple's history. Best September quarter ever for the Mac. Growth of 25 percent, driven by notebook refreshes in June and a strong back-to-school season. Education market purchases grew double digits year over year. Second consecutive quarter of double-digit unit growth for iPad. 10.3 million units sold, up 11 percent year over year. Strong demand for both iPad and iPad Pro. Units and revenue growth for iPad in all geographic markets, with particular strength in emerging markets. China grew 25 percent and India grew 39 percent. NPD says iPad had 54 percent share of U.S. market in September quarter, with 7 out of the top 10 models. Unit growth of over 50 percent for third consecutive quarter. Best selling smartwatch in the world. Upcoming Apple heart study will use data from watch to recognize unusual heart rhythms and notify users when they are detected. Wearables business was up 75 percent in the quarter. In fiscal 2017, it already generated the annual revenue of a Fortune 400 company. Cook touted the opening of Apple Michigan Avenue on Chicago's riverfront. Said it shows the future vision of Apple retail. 418 million visitors at Apple's retail stores. Back to school promotions were very successful, with sales of Mac and iPad Pro up strong double digits compared to last year. Stores conducted over 200,000 Today at Apple sessions during the quarter. Services business grew 40 percent. Momentum in India, where sales doubled. Revenue reached an all-time quarterly record of $8.5 billion. Apple on its way to doubling 2016 services business by 2020. Active Apple Pay users have doubled over the last year. Apple believes its December quarter, which includes the launch of the iPhone X, HomePod and iMac Pro, will be the company's biggest quarter ever. Apple is guiding revenue between $84 billion and $87 billion, and gross margin between 38 percent and 38.5 percent.